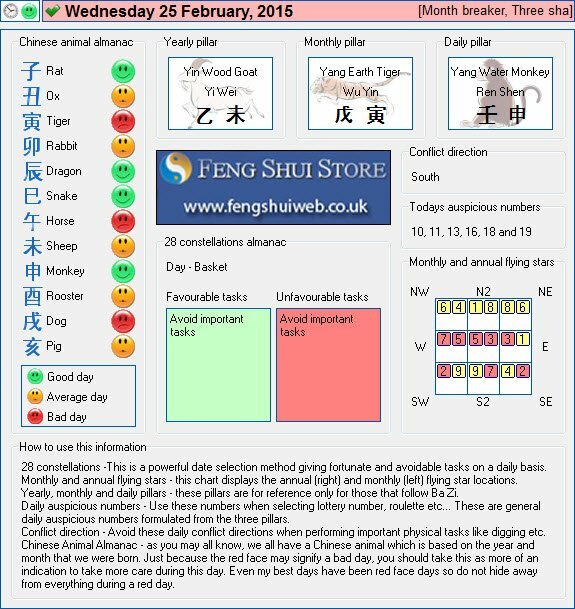 Here is the Free Feng Shui Tong Shu Almanac for Wednesday 25th February 2015. Hi, Daniel, Happy New Year, I have put all of this years cures in place, the thing is, myself, my husband and daughter have had headaches since ive done this, which we dont suffer with normally, our house front door faces east and the house sits east, our bedroom is ne, our daughters is nw, an we have patio doors west and back door south, have you got any suggestions, many thanks for this. Am I right in thinking the facing of your home is in the west if it sites east? I would recommend keeping your bedroom quiet and calm as Sui Po is located here this year. I would introduce some blue furnishings in to your daughters room this year in the way of bedsheets, pillows etc if possible. I hope this helps Collette and hope your husband and daughters headaches get better.